Bundjalung artist Digby Moran has been selected as a finalist in the Parliament of NSW Aboriginal Art Prize for not one, but two artworks. Both Starlight and Someone’s Always Watching You, painted by Digby this year, have been selected. 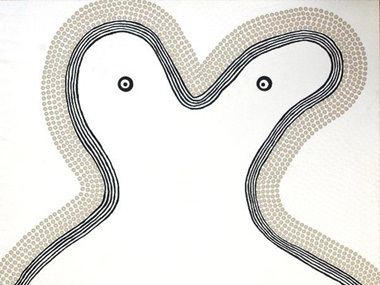 The Prize is an annual acquisitive prize of $40,000 and is awarded to the finest example of contemporary Aboriginal art in New South Wales. 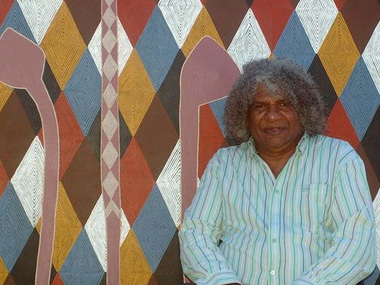 Each of Digby’s selected artworks is currently on display at the Northern Rivers Community Gallery as part of Digby’s solo exhibition Bundjalung Dreaming. The exhibition continues until 2 September, however the two selected works will leave early to travel to Sydney for the Art Prize exhibition. Starlight takes inspiration from the diamond pattern carved on the narrow Bundjalung Boondie (c1850) also currently on display at the Gallery. 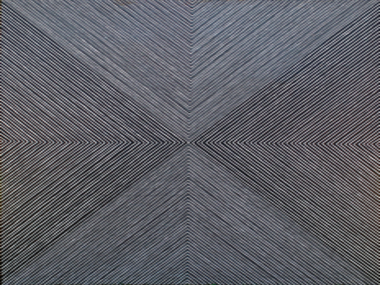 The painting has a sophisticated composition that features the intersection of four concentric diamond patterns marked out by white lines, at regular intervals, on a black background. Two of the concentric diamonds are further detailed with grey lines alternating with the white. Centre yourself to this painting, stand back and the result is something quite hypnotic and to many, optically unsettling. The sophisticated use of a limited palette, line and space creates a lenticular-like image that moves and vibrates like shimmering or shooting starlight. Someone’s Always Watching You is another example of the artist’s incredible ability to create images that seem to move right before your eyes. A series of black lines that suggest form around two eyes start to ‘move’ against the white background. As this occurs eyes look as though they are flickering and following you around the room. The Gallery is open from Wednesday to Friday between 10am and 4pm and on weekends between 9.30am and 2.30pm. The Gallery is closed on public holidays.